Posted under Health Guides. Updated 27 September 2018. Having a food allergy means that your body is very sensitive to one or more of the proteins found in certain kinds of food(s). This is different than having intolerance or sensitivity to a particular type of food(s) thus, the treatment is different for each condition. The most common foods that trigger or cause an allergic reaction in the United States are: peanuts and/or tree nuts which include: walnuts, pecans, pistachios, cashews, and others. The second leading cause of food allergy is shellfish and fish; however, it’s important to remember that any food can cause a severe allergic reaction. A person can have a food allergy to one or more kinds of food. Traces of food can also be found in non-food items such as certain medicines and vaccines. Allergic reactions target certain systems in the body which include the skin, stomach and intestines, the upper and lower respiratory system, and the cardiovascular system. An allergic reaction can range from a mild stuffy nose to trouble breathing, depending on how sensitive a person is to the food they consume (eat or drink). Anaphylaxis is a life-threatening and unpredictable reaction to an allergen. 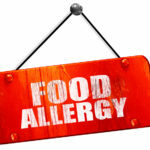 In the case of food allergies, the allergen is a certain kind of food. The reaction usually appears within five minutes to an hour after coming in contact with or consuming (eating or drinking) the allergen or in some cases it can take up to four hours for symptoms to appear, but this is rare. Exposure can happen when a certain food is eaten, for example, eggs or something made with eggs, or consuming a food that may have been made in a factory that makes other food that contains the allergen. Severe symptoms include rapid pulse, dizziness and in extreme cases, trouble breathing, closing of the airways, and loss of consciousness. What is the treatment for anaphylaxis? If you or someone you know has an anaphylactic reaction, use an epinephrine autoinjector such as EpiPen®, and call 911 right away! Anaphylaxis is serious, unpredictable and can be life-threatening. You must have an emergency plan and carry an epinephrine autoinjector with you at all times. How do I use an autoinjector pen such as an EpiPen®? Each product comes with directions. Follow the directions and be sure to hold the autoinjector so your fingertips are away from the needle. Use the EpiPen® in your outer thigh, holding it in place for about 2-3 seconds. Store your autoinjector at room temperature. Make sure that you always carry an autoinjector pen with you when you are away from home. Ask your school nurse or administrator to store one of your autoinjector pens at school. Will I have any side effects from the EpiPen®? Soon after you use the EpiPen®, you will likely notice that your heartbeat is faster than usual. You may also feel anxious and or shaky. Some people may experience dizziness and/or a headache but this is only temporary. The only way to prevent an allergic reaction is to AVOID- (Do NOT eat or drink) the particular food (or ingredient) that you are allergic to. This sounds simple enough but there are times when you may not be aware that you have been exposed to an allergen. This could happen if you eat at a restaurant or if you forget to read a food label. If you have a severe allergy to a certain food, you could have a reaction by just breathing air that might have particles of the allergen in it, such as peanut dust. Another way you could come in contact with an allergen aside from consuming it is by kissing someone who may have recently eaten what you are allergic to. There is no way of telling for sure if the reaction you have the second, third, fourth time and so on, will be the same or worse. That’s why it’s important to AVOID the allergen and also be prepared with an epinephrine autoinjector such as EpiPen® just in case you have an unexpected exposure. The good news is that sometimes people outgrow their allergies. Ask your allergist, “How can I tell if I have outgrown my allergy?” Be sure to get advice from your allergist before trying the food again. No. Having a food intolerance means that you have trouble digesting a certain kind of food. The symptoms of food intolerance can be similar but they usually appear slowly rather than suddenly. With food intolerance such as lactose intolerance, you may be able to handle small amounts of food or drinks that contain lactose (a sugar found in milk and other dairy products). Drinking or eating lactose containing products such as milk will cause bloating and diarrhea. Symptoms of food intolerance can be uncomfortable but they are usually not life-threatening. Yes. Anaphylactic reactions are not only scary, they are very serious events and even though you feel better, it’s VERY important to see a medical provider very soon. It’s best to go to the closest emergency room. There are two reasons for this. First, it is possible to have symptoms again (the same day) without coming in contact with the allergen again. This is called “biphasic anaphylaxis” or two allergic reactions. The second reason you should be checked by a medical provider is so you can develop an Anaphylaxis Emergency Action Plan. Medical providers recommend that if you’ve had anaphylaxis, you should always carry at least one epinephrine autoinjector such as EpiPen® and you should know how to use it! You might also consider wearing a medical ID bracelet so others will know that you have an allergy. Also, ANYTIME you use your epinephrine autoinjector pen, you should go to the closest emergency room to be checked. You may need more medicine, oxygen or intravenous (IV) fluids.